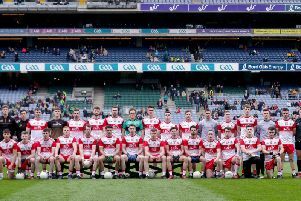 Derry champions Watty Grahams firmly etched their names into the annals of GAA history when they won the Ulster Club Minor Final at St Paul’s Park, Belfast - and they did it in the style of real champions. The Glen men showed courage to match their undoubted skills as they defeated Southern Gaels from Cavan 1-17 to 2-8 to claim the provincial title for an incredible fourth consecutive year. That winning margin may suggest that they won with a little bit to spare, but it disguises the fact that the Breffni boys made Glen fight ferociously at Shaw’s Road to retain their title. Indeed, the teams couldn’t be separated at the final whistle after the scheduled hour’s play and they needed twenty additional minutes to determine the outcome. Indeed, it was nip and tuck until three minutes from the end of extra time, when Mark Doole fired home the Derry goal to break the resolve of gritty Southern Gaels. The Gaels led by 1-2 to 0-1 after 17 minutes, but the Maghera team had reduced the gap to 1-3 to 0-4 by halfway and looked forward to playing with the wind in the second half. The Cavan side netted again but the next seven scores came from the Danny Tallon-inspired Watty Grahams players to lead 0-11 to 2-3. Gaels hit back and nudged ahead twice more but Glen responded each time, through Conor Glass and Jack Doherty, to end it at 0-13 to 2-7, to set the scene for a magnificent Watty Grahams win.